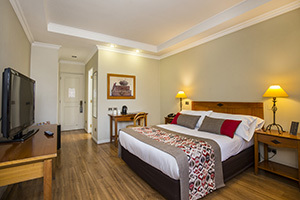 Wooden floor guest room with one Queen size bed of approximately 18-22 m2, which includes complimentary buffet breakfast in our restaurant, Wi-Fi, tea and coffee. 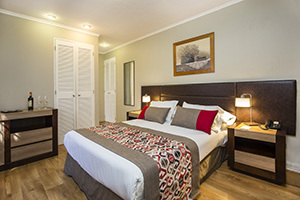 Wooden floor guest room with twin beds of approximately 18-22 m2, which includes complimentary buffet breakfast in our restaurant, Wi-Fi, tea and coffee. 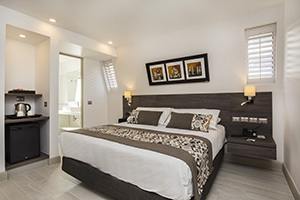 Porcelain floor guest room with one King size bed of approximately 18-22 m2, which includes complimentary buffet breakfast in our restaurant, Wi-Fi, tea and coffee. 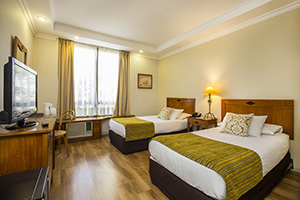 Wooden floor guest room of approximately 36m2 with one King sized bed and small studio with sofa bed, which includes complimentary buffet breakfast in our restaurant, Wi-Fi, tea and coffee. Wooden floor guest room of approximately 54m2 with one King sized bed and separate living room with sofabed (with extra cost) and additional TV. 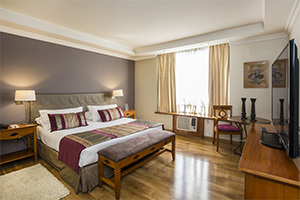 Includes complimentary buffet breakfast in our restaurant, Wi-Fi, tea and coffee.